I had to ask Kay, the granddaughter of Grama Hodne who provided me with the recipe for tonight’s treat of “(Ex) Ginger Snaps” what the “(Ex)” meant. Was this recipe somehow involved in a breakup? Oh, no, nothing so sad, Kay reported. It is a shortcut for ‘Excellent’, which they are. Perhaps I will share the recipe for that one too. After all, Kay said that Grama H would love to share it if it does some good in the world. By the way, if I keep up with the baking routine, perhaps I will earn myself a proper mixer on a stand… perhaps a KitchenAid in Cherry Red would be appropriate. As for now, I am getting by with the ol’ electric hand mixer, which I am sure was good enough for Grama Hodne! QM, I was logging on to my computer this afternoon to upload some pics of Jim’s homemade popsicles. I’m going to do a post about them. Seems food was on all our minds this weekend. But, mostly I want to say, these brownies look so tasty! I would never think to put cherries in brownies, but wow, they look so moist and the combo of the brownie flavor and the nuts and the cherries — well, it seems to not only work but to be most excellent. BTW, not knowing what Flathead cherries are (and not yet clicking on the cherry growers association link), can you tell me if they’re anything like bing? And aren’t cherries one of the best fruits? I could live off them and watermelon. We’ve been eating cherries all summer, but none homegrown. Hope you have a great August moon fire. ybonesy, I remember those gold cherries in New Mexico when we went to the Growers Market last year. I think there is a photograph in the post A Conversation Between Friends (LINK). What kind were those? I don’t know my cherries very well. But off the top of my head, the Bings seem firmer and a little lighter red than the Flatheads. There are tons of different kinds of cherries. They were brought to this country by the Colonists and settlers. Here are a few more tidbits, one from this great source on cherries. Mark’s Fruit Crops – All About Cherries (LINK). Looks like he’s got a book out, too, called Introduction to Fruit Crops. The word “cherry” comes from the French word “cerise”, which comes in turn from the Latin words cerasum and Cerasus. Sweet Cherry — originated in the area between the Black and Caspian seas of Asia Minor. Birds may have carried it to Europe prior to human civilization. Cultivation probably began with Greeks, and was perpetuated by Romans, where it was believed to be an essential part of the Legionnaire’s diet (this lead to the spread throughout Europe). Trees were planted along roadsides and were valued for their timber as well as their fruit. Sweet cherries came to the USA with English Colonists in 1629, and later were introduced to California by Spanish Missionaries. In the 1800’s sweet cherries were moved west by pioneers and fur traders to their major sites of production in Washington, Oregon, and California. Cultivars selected at that time still form the base of the industry today. skywire, those ginger snaps last night were the best by the August Moon Fire. Oh, didn’t you try a couple that you made into S’Mores? How did that turn out? We might have to post Grama Hadne’s recipe sometime. ybonesy, beautiful summer night last night. We watched the moon rise behind us as we sat by a fire on a pond. And right as we sat down, a Great Horned Owl flew over us. Our friends said the Great Horned Owls have been hanging out in the trees in their yard and near the pond. They see them every night. And we heard them last night, calling back to one another. They don’t sound anything like you would think they would! Kind of screechy! Here’s another interesting tidbit from Mark’s site (see link above). Maraschino cherries are made mostly from sweet cherries, but a small proportion of sour cherries are brined for this purpose. Cherries with clear flesh are picked slightly early, perhaps are de-colorized with SO2, then steeped in Marasca, a liqueur distilled from the fermented juice of wild cherries. 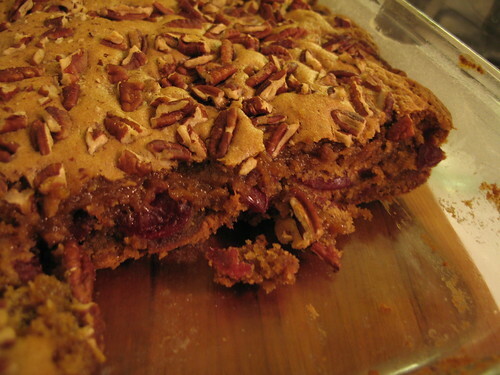 Sour cherries are primarily processed into pie fillings. The Orchard At Flathead Lake (LINK). I am on a mission to find some fresh cherries in order to make this recipe. Thanks for sharing it! I don’t know my cherries either, QM. I had to look at the link to be reminded of the yellow cherries at the Growers Market. Wow, those are really yellow. I thought maybe they’d be yellow-and-red, which is more like a Queen Anne or a Ranier. I understand from reading this great article about New Mexico cherries (LINK) that there is a yellow cherry that the local farmers call “Spanish” cherries and there is something called The Golds. But we have a bunch of other cherries, too. I didn’t see cherries at the Growers Market this season, probably on account of so many of the fruit trees getting hit by the hard freeze that came in March after an unseasonably warm Feb.
Food on a stick… cherry blondies… gourmet popscicles..
you guys could give ‘smitten kitchen’ blog a run for its money. ybonesy, that’s a cool link on the cherries. I didn’t realize Michigan was the best-known cherry producing state. You just wouldn’t think that. I always think of Montana or Washington or Oregon. They seem to grow all over the country, but really like the North and the mountains. I like her descriptions of each of the kinds of cherries.